For anyone who's ever taken the a stormtrooper's laser blasts or the roar of the Millennium Falcon's engine for granted, you should watch this immediately. 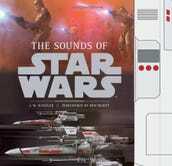 Once you wade past the initial promo for The Sounds of Star Wars—a book that I'm sure is excellent in its own right but isn't right here in front of you—you get to the goods: an account from sound designer Ben Burtt of how, and especially where, he created all of those glorious noises that make up the Star Wars universe. And then back to the book promo, which, again, fine.